When I first entered the chapel of worship inside Haiti's main national penitentiary - or central jail - I found it difficult to make sense of the sight before me. The ceiling was inexplicably festooned with plastic bags and scraps of cloth. 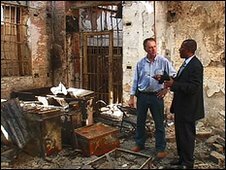 I had obtained access to the prison to investigate the aftermath of the mass jailbreak that occurred during the devastating earthquake that hit Haiti on 12 January. More than 4,000 prisoners broke out of the central prison when the walls cracked and the prison guards fled to their homes to see if their families were alive. About 1,000 more fled from regional jails which suffered a similar fate. "It's certainly one of the largest prison escapes of recent history," said Paul Biddle, a former UK prison officer now advising the British government's Department for International Development on how to help rebuild Haiti's jails. "In my experience of over 30 years there has never been an escape of this magnitude." Mr Biddle has also worked in jails in Afghanistan, Iraq and the Palestinian territories. In the chapel, my eyes were slowly getting used to the gloom and it dawned on me that this former place of worship had in fact been a grossly overcrowded communal cell. Hanging from the ceiling on lengths of string were hundreds of grubby plastic bags and water containers. 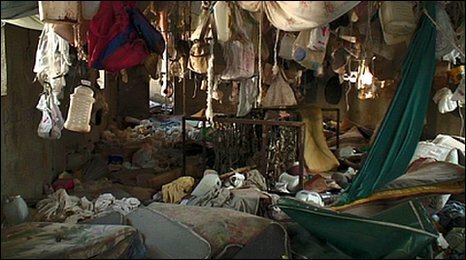 The floor was knee deep in filthy mattresses and rags. But as I looked up to the ceiling again I saw that, competing for space with the plastic bags, were foul-smelling hammocks. Then a prison officer told me how many men had been held in this chapel-turned-cell roughly the size of a tennis court - and it all began to make sense to me. "Three hundred and eighty-six in the chapel," the prison officer said. The overcrowding was clearly so inhuman that the prisoners did not have enough room to exist on the floor. So some had slept in hammocks suspended from the ceiling. There were no toilets that I could see there. So I can only assume that the plastic containers hanging on string were to keep the dank drinking water they contained from the sewage at ground level. No wonder that when the earthquake hit, the men smashed and scrambled their way out. Even a broken city in mass trauma was better than incarceration here. In the corner of a nearby courtyard some of the escapees had strung together the classic comic-book-style rope made of bed sheets to make their way to a parapet wall. But there was nothing comical about the scene. On the concrete floor - among the rags, the abandoned Bibles and the strewn playing cards - were the stains left by the bodily fluids of four men who died in the chaos. Their bodies had putrefied and burst in the heat before the Red Cross came to take them away. They may have been killed by masonry falling from the crumbling walls or they may have had a fight. We will probably never know. Several pairs of plastic slippers lay abandoned on the stained concrete floor. The Haitian authorities have recaptured only 200 of the 5,000 prisoners who escaped. But they are pleased that they have at least made a start. They are holding the 200 in a corner of the central prison relatively undamaged by the earthquake. I toured the jail with Frantz Charles Dehonnet, deputy director of Haiti's penitentiary services. "We had to re-establish part of the prison to give the police confidence that they have somewhere to put people they have arrested," he said. "We also want to give the people the reassurance that the system of justice is being re-built, because as soon as the jailbreak occurred there was an upsurge in criminality and fear. We want to tell the people we are rebuilding justice." Unfortunately, Mr Dehonnet - who appeared to be a frank and intelligent man - left the prison for another meeting before I had understood the conditions of incarceration in the chapel. Questions to the Haitian authorities about this outrage will have to wait for another day. But I left the national penitentiary with two impressions. The first was the nightmarish chaos and violence that must have ensued when a massive earthquake hits a large jail. The second impression was of the dreadful conditions that the inmates - many of whom were on remand, not having been properly convicted of any crime - endured before the quake. 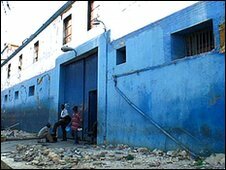 Haiti's prison service has been offered help to rebuild and manage its jails from experts at the International Committee of the Red Cross, and from Canada and Britain. The earthquake has left a legacy of fear and thousands of alleged criminals on the loose. But what I saw in the central prison of conditions before the quake hit showed that the entire system of justice and the entire philosophy of rehabilitation of offenders needs rebuilding. Justice needs strong walls that can withstand an earthquake. But Haiti has a lot more to fix than that.